Jeff Winter, City of Lakes 25K race founder and author of the article below, passed away on October 13, 2012 of brain cancer. He will be missed greatly. At the MDRA 50th Anniversary Party in March, 2011 Jeff was honored with a lifetime achievement award for all of his work for MDRA and his 30 + years of race directing the Ron Daws 25K and the City of Lakes 25K. We will miss his passion for MDRA and the City of Lakes 25K. In 2013, Heidi Miler, who was assistant race director to Jeff Winter for years, became the new City of Lakes Race Director. In January, 2014, the MDRA Board voted to change the City of Lakes race distance from 25K to Half Marathon. The decision was made after much discussion, taking into consideration the changing demographics of today's runners and recognition that in keeping with the tradition of City of Lakes as a training run for Twin Cities Marathon, 13.1 miles was a better fit in the training calendar. If, perchance, you have shopped at Marathon Sports located in south Minneapolis you may have noted one, enlarged black and white photo on the wall of that store. In that photo, a small, single digit, cluster of runners are poised at a start line. That photo is the start of a marathon race run on the River Roads during the late '60's. This was a typical field for its day. With the fields of the Grandma's and Twin Cities marathons now numbering in the thousands this may be a very difficult concept for post 1980's runners to relate to. With that photo as a backdrop, this article is authored to give readers some background as to the roots and development of the former City of Lakes Marathon. That race was the historical forerunner of both the Twin Cities Marathon and the City of Lakes 25K both of which are fixtures on the current Minnesota running schedule. Prior to 1975, the Minnesota Running Association ran its annual marathon in the fall of the year, usually late October. In the early seventies, it was the only annual marathon run in Minnesota and drew less than one hundred entrants. Running was then perceived as something only eccentrics did and most runners evolved from either a high school or college running experience. In 1972-74, I came to know or could recognize most everyone who ran daily on Lake Calhoun. They numbered less than twenty. There were few women running to speak of on the city lakes until the mid-seventies. Running was not to become a mainstream sport until Frank Shorter won the Olympic marathon event, in 1974. That proved to be a watershed. Shortly thereafter, sponsorship and money began to flow into running. Road races grew and race management was forced to become a science to deal with the steadily increasing number of people running road races. In historical terms the 1978-1985 period was known as the Running Boom. Directly tied to the maturation of the Baby Boom generation, running became another demographical aspect of that group's movement through time which has often been described as "a pig passing through a python." The 1972-74 fall MDRA marathons were run around Bald Eagle Lake, located in White Bear Lake. The race was known as the Land of Lakes Marathon and received a small stipend from Land of Lakes Creamery to help fund the race. The approximately, 6.75 mile Bald Eagle course featured little conflicting traffic, relatively low population density and a suitable staging site. With fields of less than one hundred, running events found little used roads and sites to stage races so as to minimize logistics and costs. Race entry fees at that time were about $5-7 dollars or less. In Minnesota, race t-shirts were not given out until 1974. Race management was done by running club members volunteering their time. The LOL marathon director in both '72 and '73 was John Christian, an active runner and race competitor. He worked for Hennepin County Parks locating land sites suitable for purchase as future Park Reserves and was active in locating Baker Park Reserve and the Carver Park Reserve sites. John was also active in the Minnesota Running Association, as the MDRA was known as then, serving on the club's board and organizing races. He directed the Land of Lakes Marathon and the Hopkins Raspberry 5 Miler another popular race for the club. By 1974, however, John's job and family demands required that he take a less active role in the club. He approached me about the possibility of directing the '74 Raspberry Five and Land of Lakes marathon. I agreed to do so. Thus was launched what was destined to become a now four decade race management experience. By 1974, running was growing and the entries in both the Raspberry race and the Land of Lakes Marathon reflected that. The Raspberry race climbed to three hundred participants and the fall marathon registered close to 150 entrants. Finish (not entrant) T shirts were given out at both races that year for the first time. The '74 marathon shirt was royal blue with a silver print of the race name and a goosed bald eagle as the front imprint. I still have that shirt. (I wore it to several '90's races and people there expressed surprise to learn that marathon races were run as far back as 1974.) I had ordered one hundred LOL shirts for finishers. That was more T-shirts than had been previous finishers. Over a hundred runners showed, however. The weather that day was unseasonably warm for October-into the low eighties. The distance required just under four loops of the 6.75 mile Bald Eagle course. By the second loop, any concern I had about having enough shirts evaporated as well over a third of the field had dropped out due to the heat. Steve Hoag went on to win the summer-like race. 1974 later proved to be the last Association annual marathon held on that course. In early 1975, Jack Palmer of the Minneapolis Park and Recreation Board (MPRB) approached the by now titled Minnesota Distance Running Association (MDRA) with a proposal to stage a fall marathon, on Lake Calhoun and Harriet, in Minneapolis. The race concept had been brought to MPRB by a Steven Bruhjel; who ran and worked at a fitness facility located in downtown Minneapolis. Seeing Bruhjel's proposal, the growth of running and an opportunity to be part of it; MPRB offered to provide the facility and adequate traffic control as their part of such an event. MPRB approached MDRA about co-producing the race and handling race logistics. The members of the board, of which I was one, jumped at this opportunity. It was a chance to bring running into the city proper on one of Mpls's premier park facilities. I offered to direct the race for the MDRA. Ed Arenz, also a MDRA board member, and I measured the two-lake course which, ironically, proved to be about the same distance as the Bald Eagle course, thus requiring four loops. Jack Palmer was assigned to serve as the Park Board coordinator to the marathon-a role he continued well into the '90's. By 1978, the citizen's race event was discontinued as it never developed a large following (odd distance?) and by 1977 many other options had developed for runners to participate in timed events.) The original, four-loop path course was suited to races of less than 1000. At the marathon distance, however, lead runners began to lap slower participants on the fourth loop creating problems both for the runners and race management. As the marathon field grew this lapping proved to the Achilles heel of the two-lake course. In order to deal with this and encourage competitive finish times marathon results were kept and displayed only until four hours. In today's mass participation marathon fields that four hour standard would effectively eliminate well over 50% of finishers. At that time, it eliminated less than 5% of entrants who actually showed to run, however. Marathons were still viewed as competitively oriented running events. Post 1976 and Frank Shorter's aforementioned Olympic marathon win, running began to change rapidly. Running events, predominately 10K's (6.21 miles) sprung up rapidly. So did the number of marathon entrants. With the increase in running participant numbers came a demand for improved running shores and apparel. Seat of the pants operations such as Phil Knight's Blue Ribbon Sports morphed into Nike, Inc. to satisfy the demand. By 1978, sponsors eager to reach the Baby Boomers (now in their 30's) saw the Running Boom as an avenue to do just that. 1978 saw the inaugural Get in Gear 10K (4500 runners) event which distilled all of the above cited demographical/retail trends and created the area's first mega-race instantly. Grandma's Marathon, in Duluth, gave marathoners a summer option to run the distance and a second annual marathon event in Minnesota. 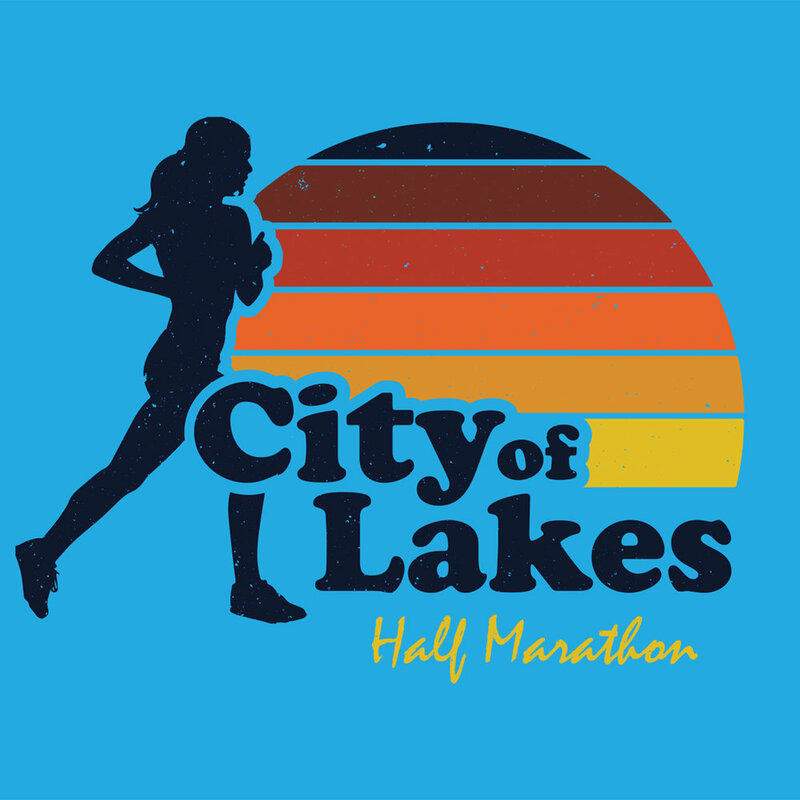 By 1977, Land of Lakes sponsorship had disappeared and the name City of Lakes Marathon had been adopted by the race-derived from and using the familiar City of Minneapolis logo. Participant numbers were increasing rapidly. In early 1977, Winter and the MDRA were approached by National Car Rental (then a locally domiciled business) about providing major sponsorship to include national advertising to the '77 City of Lakes Marathon. An agreement was reached. National Car hired Padilla and Speer a local public relations firm to promote the race both nationally and locally. They also brought in Mickey Gorman, a nationally prominent woman marathoner, to headline the race. Numbers jumped significantly that year which was to be the last the race was run using the paths around the lakes. The process of working with sponsors in running events was new. National Car and the MDRA crossed swords on several issues affecting both the events and the runners; not the least of which was the provided finisher shirt which was truly a National Car billboard and poorly suited to a running T shirt. National Car also had tried to superimpose their then advertising moniker of Big Green Team on the event with MDRA agreement. The relationship was discontinued after the one year when the MDRA Board voted to move on without National Car which expressed interest in doing a second edition. Note: in 1978, Padilla and Speer told the MDRA and Winter that any local marathon would not be a national or locally prominent event, in their opinion, unless it was run between both cities. It is possible that if National Car had been less heavy handed in attempting to take control of the '77 City of Lakes race that a second joint venture might have been possible and perhaps the two cities course they proposed might have been looked at more closely. Marathon history locally might have been altered. By 1978-9, time and demographics were encroaching upon the multi-loop marathon course, as well. Increasing numbers required COL Marathon moving to city and parkway streets around the lakes. This move did help solve the crowding. It did not solve the problem with runners being lapped, however. There was also now a ground swell movement within the running community for a different course or perhaps a national caliber Twin Cities Marathon. Additionally, COL growth had flattened out - by definition - as the field was limited to 1200 entrants from 1979-81. There was now additional surplus demand for marathon entries. Winter began to explore other course options with the MPRB using the Minneapolis Parkway system. Neither MDRA which was dealing with exponential membership growth, nor the MPRB seemed anxious to make such a move, however. Events were transpiring in St. Paul, as well, where planning for a St. Paul Marathon, to be introduced in the fall of '81, was being led by Steve Hoag and Joe Bird. Staged on a one-loop course using St. Paul's parkway system, the St. Paul Marathon concept was well received and siphoned many runners away from the City of Lakes race who were interested in trying a new course and event. The stage was now set for each city to have its own event. In an effort to prevent this from happening, then MDRA President Jack Moran, fielded his vision of a true Twin Cities Marathon course using both Minneapolis and St. Paul's parkway system to the MDRA board at a meeting held at Macalester College. The Minnesota Distance Running Association did not share his now messianic enthusiasm for the plan as it considered the process of getting such a logistically intensive venture going overloading its all-volunteer structure. At odds with the association, Moran offered his resignation to the MDRA, and began gathering a TCM core organizational group from among his running colleagues at the University of Minnesota and other influential supporters of his plan who ran. With a Herculean, one year effort they were able to launch a Twin Cities Marathon, featuring a two cities course, in October of 1982. As that race grew over time to local and national prominence, the words of David Speer to the MDRA, in 1978 proved to be prescient. 1981 thus became the last running of the City of Lakes Marathon race. It also marked the loss of control of the annual fall marathon by the Minnesota Distance Running Association.